Photo: Ronstadt House, ca. 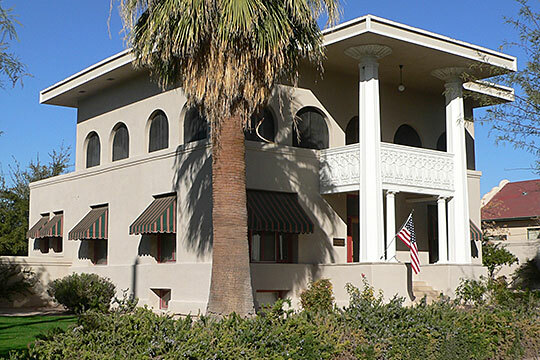 1904, 607 North 6th Avenue, Tucson, AZ. Built by Frederick Ronstadt, designed by noted architect, Henry C. Trost. Listed on the National Register of Historic Places in 1979. Photographed by User:Ammodramus (own work), 2012, [cc-by-1.0 (creativecommons.org/publicdomain/zero/1.0/deed.en)], via Wikimedia Commons, accessed July, 2013. The Pima County Administration Offices are located at 130 West Congress Street, Tuscon AZ 85701; phone: 520-740-8126. Pima County takes its name from a once-numerous tribe of Indians, who dwelt within its limits and made their living by agriculture. Pima County has an area of 9,424 square miles, making it about equal to the States of New Jersey and Rhode Island combined. Pima County is one of the original counties into which Arizona was divided by the first legislature that met at Prescott in 1864, and is the portion of the Territory first settled by Europeans. This county is bounded on the north by the counties of Maricopa and Pinal; on the east by Graham and Cochise Counties; on the south by Santa Cruz County and the Mexican State of Sonora, and on the west by the County of Yuma. Tucson, the oldest and at this time most populous town in the Territory, is the county-seat. This county has a large amount of fine land for agricultural purposes along the Santa Cruz River, which crosses the county from southeast to about northwest. There are several tributaries of the Santa Cruz, along which there is fine land for cultivation. Much of the tableland or mesas would produce well if water were gotten upon them. What is necessary is that artesian wells should be developed, or that the great amount of water that runs to waste during the periodical floods of the Santa Cruz River and its tributaries, the Rillito and other streams, should be gathered into reservoirs for use upon the land during seasons of drought. There are several mountain ranges lying partially or wholly in this county, and there have been many mining claims taken up in all of them. Some few have been patented, but most are held by possessory title. Some are being successfully worked, while on others only enough work is being done as development work to hold the claim under the mining laws of the United States. Many considerable fortunes have been made from working the mines and from the sale of mines. Some settlements were made by the Spaniards within the limits of Pima County, or what was Pima County, as early as 1687. The Mission of San Xavier del Bac, some nine miles southwest of Tucson, was started by the Society of Jesus in that year; also a sub-mission near Tucson for a school for the Indian children, and visited by a priest at stated periods. The presidio of Tucson was occupied by Spanish soldiers as a military protection to the mission soon after. The Indian rancheria, or as some call it, "Old Tucson," was about a mile a little west of south from where the city of Tucson is today. Pima County as originally constituted included all of the Gadsden purchase, from the 109th meridian of west longitude to the county of Yuma upon the west. Since that time there have been taken from the county of Pima two entire counties, viz. : Cochise and Santa Cruz, and those parts of Graham, Pinal and Maricopa lying north of the Gila River. The light of Christianity for Arizona first shone, though faintly, through the night of barbarism within the limits of Pima County, and though many times nearly extinguished, again blazed forth, until it has illuminated the dark caves of superstition with life-giving light, and the inhabitants stand forth in the full blaze of the regenerating Gospel. Rich in mines, in grazing land, in soil for raising grain and vegetables, in timber, in purest air and almost perpetual sunshine, Pima County offers great and varied inducements for the capitalist, the merchant, the mechanic or the hardy tiller of the soil, or whoever seeks an ideal home which can not be surpassed in any part of the world. Tucson, the county-seat, from its position in the Santa Cruz Valley, is the great center, commercial and social, and source of supply for a vast domain. In Pima County are many mountain ranges and detached peaks, some rising to a considerable altitude, though hardly assuming the majesty of great mountains. To the east and northeast of Tucson are the Santa Catalina Mountains, whose culminating point is Mount Lemon, nearly ten thousand feet above sea-level; while to the southeast from same point is what is generally called the "Rincon." The apex or highest point is called by the Spanish-speaking people, "Santa Rosa," whose altitude is about eight thousand feet above sea-level. South from Tucson, some thirty-five miles, is the Santa Rita Range of mountains, crowned by "Old Baldy," or Mount Wrightson, with an altitude of 11,400 feet; but the major part of this range lies in the adjoining county of Santa Cruz. West, about fifty miles, is the Baboquiveri Range, with the apex rising up to the altitude of 10,600 feet above sea-level in massive and rocky grandeur. It has generally been considered that the foot of man had never trodden this lofty summit, but in 1898 Professor Forbes of the University at Tucson, by the aid of ropes and grappling hooks, made the ascent and spent a day or more upon this elevated rock, leaving a fire burning, which attracted the attention of the people of the surrounding country for a circuit of thirty or forty miles; and among the superstitious Papago Indians it at first created great consternation, they thinking their mountain god had commenced to burn. One of their chiefs, more venturesome or less superstitious than his people, ventured to the mountain and saw Professor Forbes upon the summit, saw him come down, and his evidence served to dispel the illusion. There is a tradition among these Indians that many moons before the white man appeared in the country one of their great chiefs had a beautiful daughter, so beautiful that even as a child whenever she appeared great crowds followed her and were ever eager to gaze upon her exquisite face and form. From the charm of her voice she had been named in their language "The Heavenly Vision."